What a surprise! I couldn’t keep my tinyletter On the Fringe going during fringe time. But it’s not too late to write my list of fringe’s Adelaidies even if it was originally intended for International Women’s Day. These are all women from Adelaide who help to ensure that the fringe is not just one month of arts excess each year, but has a deeper impact on Adelaide’s arts ecology. I’m going to begin with my director, Maggie Wood. She not only directed my show, but also reprised her role as Catherine Helen Spence in A Soapbox for Democracy. Read more about this brilliant production here at the Muriel Matters Society website. She also did countless comedy spots, including at our friend, Ross Vosvotekas’, Late Night Comedy. Odette Pearson is on the board of the Fringe. She is a Kuku Yalanji-Torres Strait Islander woman and a health researcher. She was appointed to the board late last year. I think that demonstrating the connection between arts and health in this formalised way is brilliant. A few personal and family issues came up during the fringe festival which meant I didn’t get to see all the shows I had planned to see. This included two Made in Adelaide winners, Anya Anastasia performing her latest show and Michelle Pearson performing the food and cabaret extravaganza, Just Desserts. In fact, since its inception three years ago, the Made in Adelaide award has been awarded to a woman each year. The first winner was Joanne Hartstone who produced A Soapbox for Democracy noted above. Joanne is truly formidable. She writes and performs in her own shows, most recently, That Daring Australian Girl about suffragette Muriel Matters (which I saw at Holden Street last year and loved). 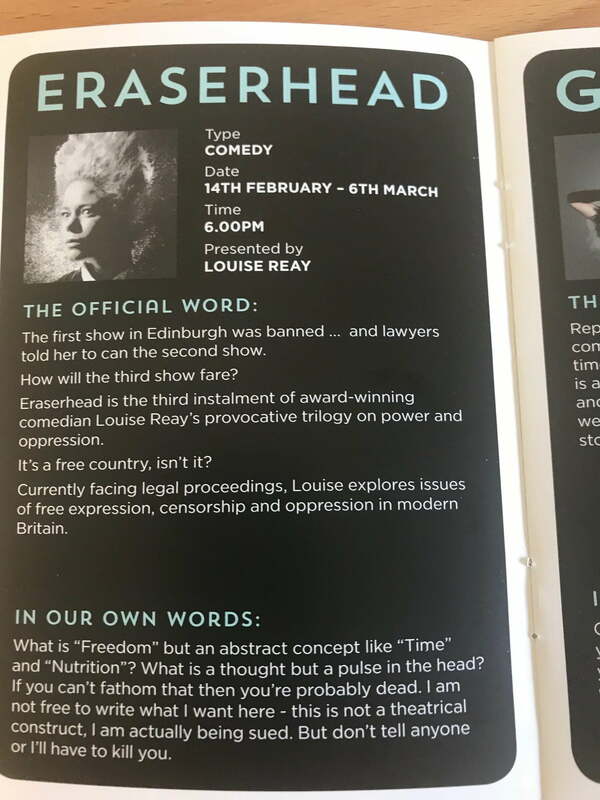 She also curates the programme at the Noel Lothian Hall as well as some at Holden Street Theatres. It’s hard to find theatre spaces for fringe productions if your show doesn’t suit one of the tents in the hubs. I love what Joanne says about producing theatre in this article. Another show I wasn’t able to see–this time because it clashed with my own–was Alison Paradoxx‘s Floral Peroxide. Winner of the 2016 poetry slam championship Alison hosts a regular open-mic night at The Libertine by Louis, The show included open captions by video poet, Ian Gibbins, and was an exploration of disability in the context of a society that is constantly trying to ‘fix’ disability. I hope that I have an opportunity to see more of her work this year. Pamela Munt at the Bakehouse Theatre is one of my new favourite people. What a calm and soothing backstage environment she creates. I was still extraordinarily nervous about staging my show in an actual theatre, but having Pam in charge made an enormous difference. If you are looking for a venue to stage your fringe theatre show I highly recommend The Bakehouse. In terms of fringe theatre venues, Holden Street Theatres is one of the best. This is thanks to Martha Lott who not only brings excellent theatre from the Edinburgh Fringe but also supports new local writing. Through supporting writers and building audiences she makes a contribution to our local arts scene that cannot be underestimated. When I started performing stand-up, Lori Bell always made me jealous with how easily she made the crowd laugh. And while I gave stand-up away years ago, she has become a real comedic talent. As an MC she is outstanding, the crowd never doubting that they are in safe hands. And Granny Flaps continues to be outrageous and hilarious. My list has blown out from nine again, but I do want to include one more…this time a reviewer. Kylie Maslen is a really interesting writer who has returned to Adelaide after some years in Melbourne. Let’s not be coy: fringe reviewing is, by and large, dire. So although I didn’t quite agree with all her reviews for Fest Magazine, all artists should be grateful to writers like Kylie. She writes with intelligence and generosity, and as the 2018 recipient of the Kill Your Darlings New Critic Award, she has a grounding in arts criticism that too few fringe reviewers share. So that’s that, my belated International Women’s Day edition of my fringe newsletter.